The past few days have revealed an emerging trend which should be heartening to faithful Catholics who have for so long yearned for good news. As we sent our congratulatory message to Cardinal O’Malley, we learned that Pope Francis has clarified by his words and his actions the true meaning of heroic virtue in our day. According to chiesa.espresso, the Holy Father’s reason for not giving the sacrament of Holy Communion at public Mass is “because he says unrepentant public sinners could slip in among the faithful, and he does not want to back up their hypocrisy.” In other words, the pope understands that Church law, known as canon 915, is not a mere suggestion but is in fact a law designed to protect Christ from sacrilege. Pope Francis also surprised the world on Mother’s Day when he joined the Italian pro-lifers at the March for Life in Rome. 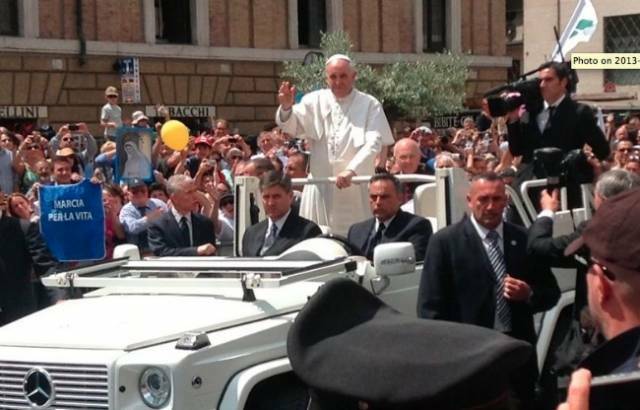 More than 40,000 Italians cheered and celebrated this historic visit by the vicar of Christ to their event. Riding in his popemobile, the pope thrilled those in attendance, and the rest of us vicariously. If we look at today’s world, we are struck by many negative factors that can lead to pessimism. But this feeling is unjustified: We have faith in God our Father and Lord, in His goodness and mercy. As the third millennium of the redemption draws near, God is preparing a great springtime for Christianity, and we can already see its first signs. In fact, both in the non-Christian world and in the traditionally Christian world, people are gradually drawing closer to gospel ideals and values, a development which the Church seeks to encourage. Moments of joy like those described above occur according to a timetable over which we have no control. Yet when we reflect on the actions of Cardinal O’Malley, Pope Francis and, of course, pro-life people the world over who never give in to pessimism as we fight for the dignity of the human individual, we can see that the new springtime is bearing fruit. For that we give thanks. When American Life League’s Pray and Fast for Our Bishops project was begun this past Ash Wednesday, we had—and continue to have—every confidence that there really are some evils in the world that can only be driven out by prayer and fasting. At the same time, we see by the examples given here that with our prayers for bishops we also send our thanks for the courageous deeds of Cardinal O’Malley and Pope Francis—men who love God more than human respect.